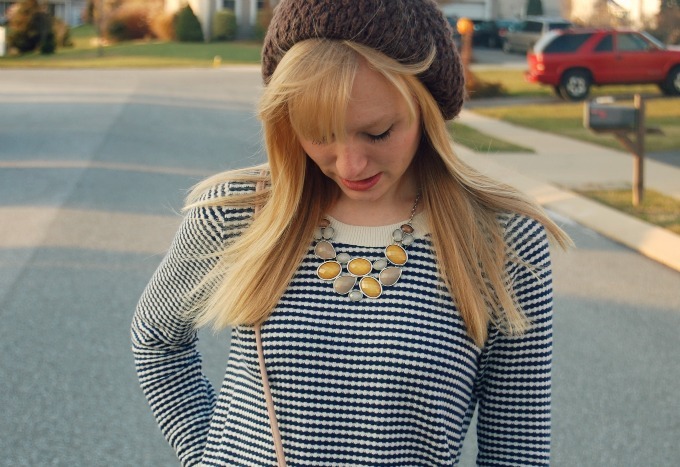 The statement necklace trend is one of my favorites. Unfortunately, not having a job right now (full time student) doesn't let me splurge on some of the statement necklaces I'm wanting and that's why I was so happy when I found this piece for only $5 at New York and Company! I've paired it with so many things, I love how despite the off-yellow color it can match so many different outfits, adding that perfect last touch. 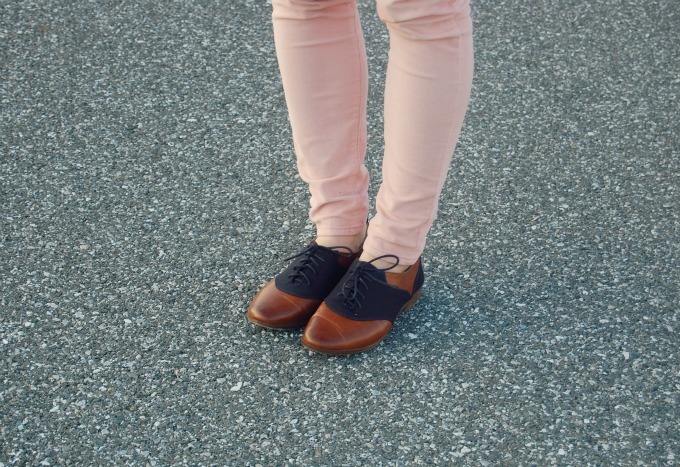 Also, I'm currently having an obsession with Francesca's Boutique and found the perfect pair of oxfords through them. And yes, I am wearing my pink pants again. Seriously obsessed. Doesn't this scalloped edge purse match perfectly? I love that sweater! I just passed up a similar, larger-striped one on F21's website... now I'm wishing I hadn't! 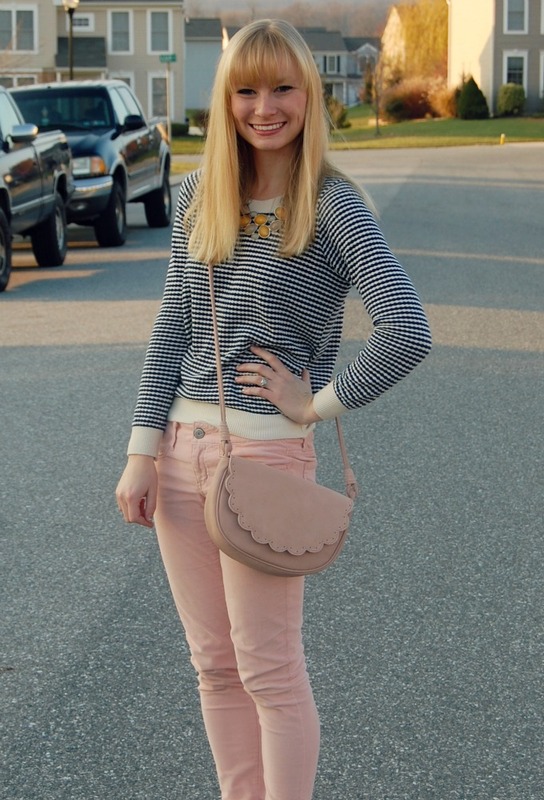 I love these pale pink pants paired with this top! Absolutely adorable. And the scalloped purse is perfection! I love your style, I'm your newest follower! Your purse and skinnies really DO match perfectly! 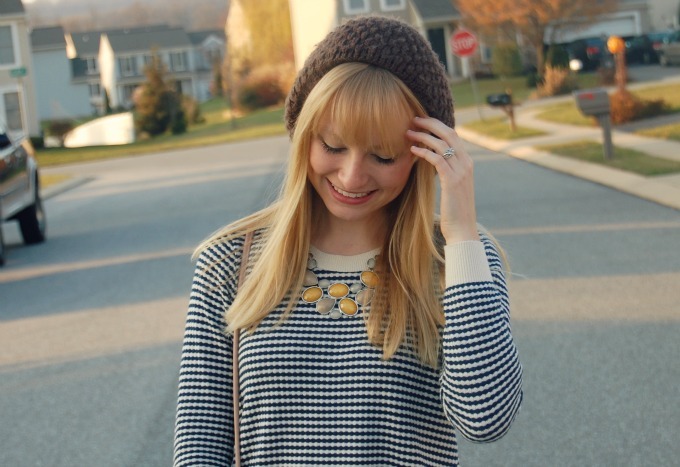 I just adore all of your fun accessories here~ your hat, your necklace, your shoes... you're just so darn cute! Love the pale pink jeans! You look so cute, I love the pink cords. And that necklace is really pretty! I think this is my favourite outfit of yours. I love the matching purse and pants and the beautiful statement necklace. whoa! you look cute!! adorable! i love those oxford shoes and you really look cute in that pants and top! i really hope you follow me back too! Very pretty necklace. I am always pleased with NY & Co. I also like your stripes and pastels and the hat is adorable! Nice look! In love with your sweater and shoes! cute look! Just added you as on GFC, follow me back! 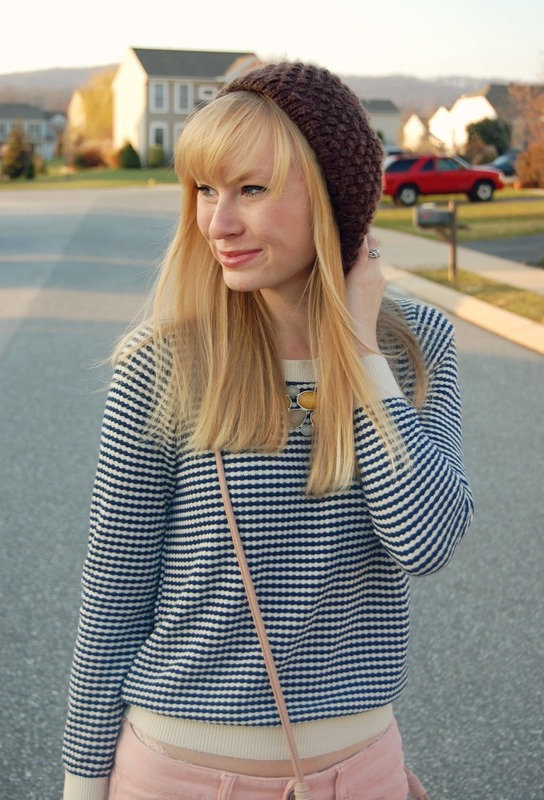 That scalloped purse so so perfect! And it definitely is a match made in heaven with your cute pants! Thanks for your comment over at beautyandbows! LOVE your blog, new follower for sure. You have the sweetest style and smile! you're looking lovely with that pretty necklace! i love the pastel pants and the purse! they look so perfect together! I am definitely loving that purse of yours! you're beautiful chelsea elizabeth! what a smile. it looks so pretty where you live. :) i like the hat, the statement necklace is fun. your pants remind me of my mauve cords. yours are skinny, and mine are wide leg. Love this super cute outfit!! I love those oxfords and the sweater! I love the color of your pants with the shoes! So adorable. Your purse is so cute!! Beautiful necklace too!! you have such beautiful photos and i love your style. This outfit reminds me so much of Taylor Swift. So pretty. This instantly reminded me of one of my favorite Taylor Swift outfits (with the cute brogues) when I saw it! And you look so much like her, too! Very pretty look - I love the necklace, too!